The committee wants access to the same data and presentations that will be provided to the Economic Management Council. TDs Sean Fleming and Timmy Dooley at the committee meeting this morning. 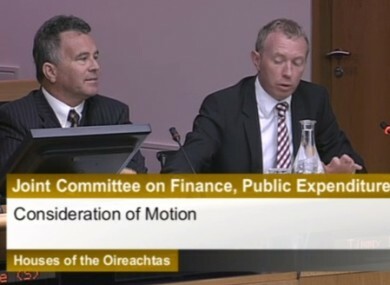 THE OIREACHTAS FINANCE Committee has passed a motion today requesting that the same forecast data and briefing that will be given to the Economic Management Council is also provided to its members before the budget. Fianna Fáil’s Timmy Dooley, who proposed the motion, said that this could be done effectively and on a confidential basis. The committee was told that the minister for finance had offered to provide “a version” of the presentation to the council available but Sean Fleming said he did not want “to be given the Ladybird version” of a bigger document. While TDs and Senators were supportive of Dooley’s motion overall, Sinn Féin’s Pearse Doherty stressed the importance of the committee having access to the data at the same time as the council. His sentiment was echoed by Kevin Humphreys who said he felt it important that the committee should have this information with sufficient time “to respond in an informed and proper manner”. Doherty also referenced a move by the late Brian Lenihan ahead of a budget in which he invited opposition spokespersons in to discuss proposals. “We need to come to a better system where people are better informed in advance of the budget,” he said. The motion passed after a vote and the committee will now request that the department provide the data ahead of the budget for consideration. Email “Finance Committee demands forecast data from department ahead of budget”. Feedback on “Finance Committee demands forecast data from department ahead of budget”.